Readers Question: Can you please discuss the nature of the current account deficit and the exchange rate in the UK along with the theory that would suggest there is a relationship between the exchange rate and the current account. A current account deficit implies the value of imports of (goods/services/investment incomes) is greater than the value of exports. If there is a depreciation in the exchange rate. Then that particular country will experience a fall in the foreign price of its exports. It will appear more competitive and therefore there will be a rise in the quantity of exports. 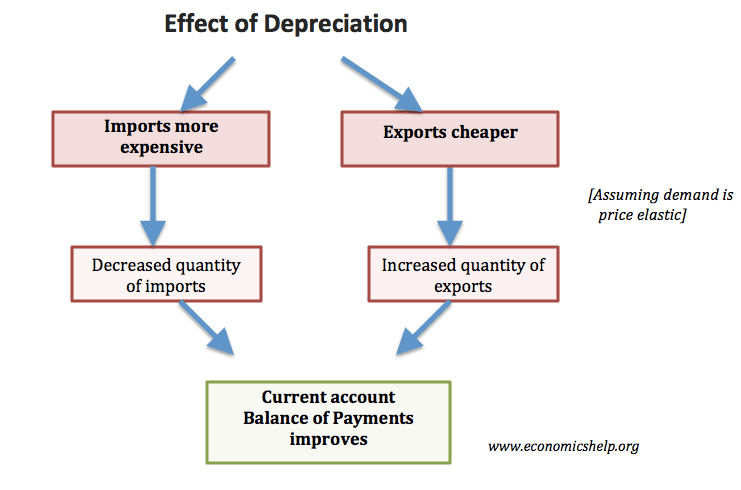 Assuming demand for exports is relatively elastic then a depreciation will lead to an increase in the value of exports and therefore improve the current account deficit. Similarly, a depreciation of the exchange rate will also lead to an increase in the cost of buying imports. This will lead to a fall in demand for imports and also help to reduce the current account deficit. An appreciation should worsen the current account. However, in practice, this might not happen for a variety of reasons. 1. Elasticity of Demand. The impact of a depreciation depends on the elasticity of demand. The Marshall Lerner condition states that a depreciation in the exchange rate will only improve current account – if combined PEDx and PEDm is greater than 1. For example, if demand for UK exports is very inelastic. They a depreciation will lead to only a very small increase in quantity demand. 2. Profit Margins. A depreciation means exports can be cheaper. However, a UK firm may decide to keep the same foreign price and just make a bigger profit margin. This often occurs in the short term. Firms don’t adjust prices to consumers but have exchange rate movements absorbed in their own margins. This is one reason why a movement in the exchange rate often takes time to affect the current account. 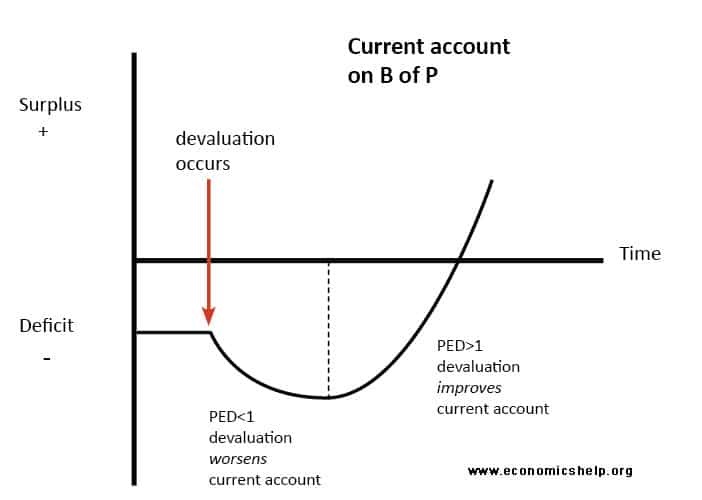 The J Curve effect states how a depreciation can worsen current account in the short term because demand is inelastic, but, over time, demand becomes more elastic and therefore the current account improves following a devaluation. 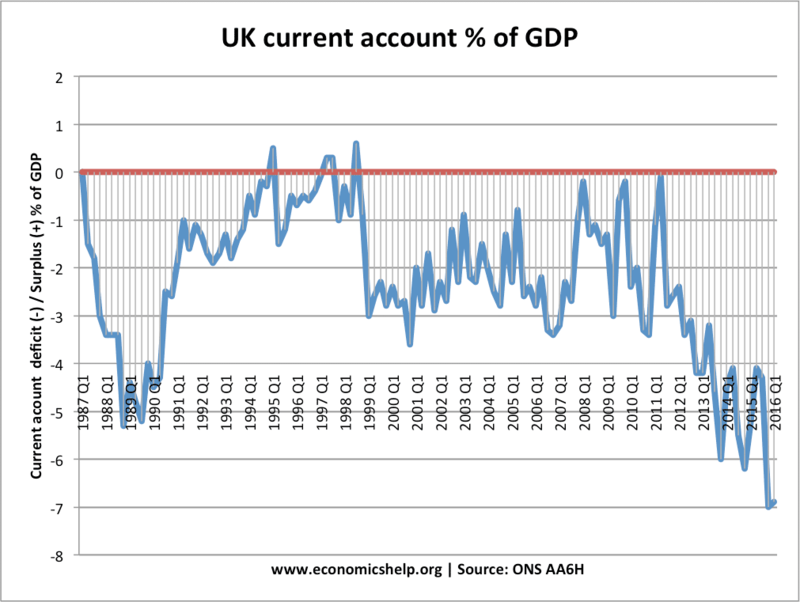 During 2008-09, the depreciation in the Pound Sterling didn’t affect the UK current account deficit. One reason was the sluggish global growth. There was little foreign demand for UK exports despite the fall in price. 4. Economic growth. A key determinant of the current account is domestic spending. When consumer spending is growing, countries will be buying more imports. In a recession, with falling consumer spending, the current account tends to improve (lower deficit). 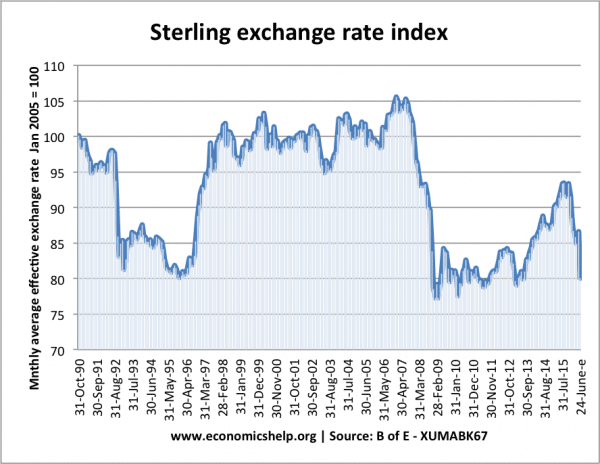 For example, in the examples below from 1989-92, the current account improved – despite the Sterling index remaining constant. The reason for this improvement was the recession of 1990-92 and slowdown in consumer spending. In 1992, the UK experienced a 20% devaluation in the value of the Pound. After 1992, the current account improved – leading to a small surplus in 1995. 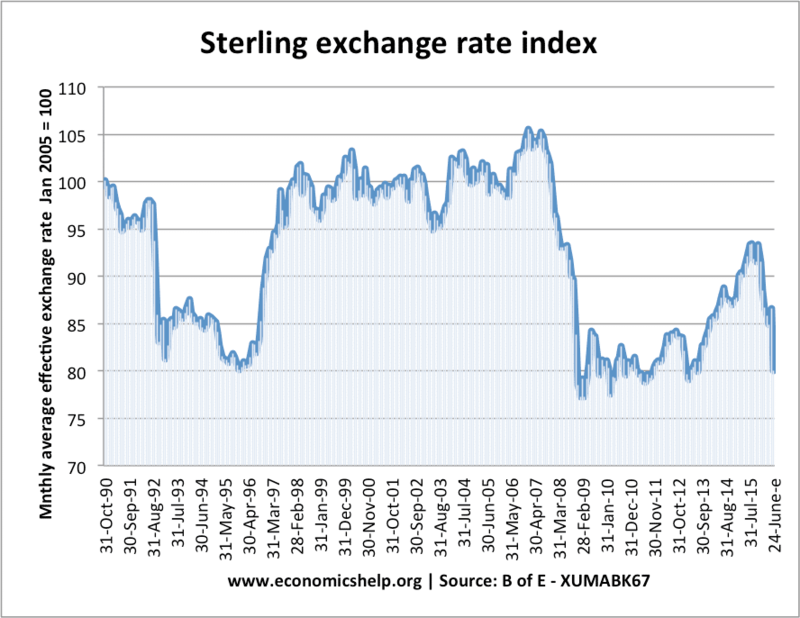 From 1997 to 98, the Pound appreciated over 20%, this caused a deterioration in the current account 1998 to 2000. The confusing example is the depreciation in 2016 (post-Brexit vote) Yet the depreciation did not help improve the current account – the current account continued to worsen. However, the important thing is to see what happens in the long-term as the effects of changes in the current account often take time to have an effect. I beleive this is waht would happen in any country including the poor and developing naions! Or is the situation different in those countries considering they have less exports and numerous imports?